PASADENA, Calif. -- NASA research indicates hunks of frozen carbon dioxide -- dry ice -- may glide down some Martian sand dunes on cushions of gas similar to miniature hovercraft, plowing furrows as they go. Images from MRO's High Resolution Imaging Science Experiment (HiRISE) camera show sand dunes with linear gullies covered by carbon-dioxide frost during the Martian winter. 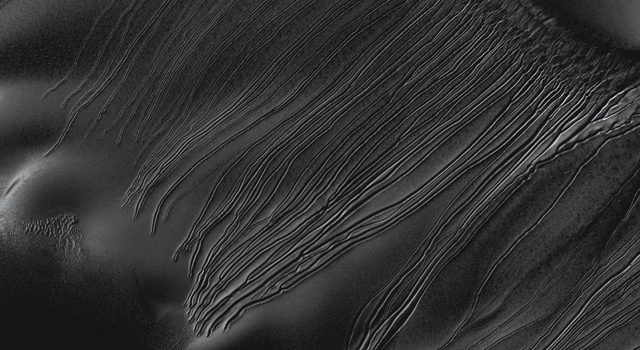 The location of the linear gullies is on dunes that spend the Martian winter covered by carbon-dioxide frost. By comparing before-and-after images from different seasons, researchers determined that the grooves are formed during early spring. Some images have even caught bright objects in the gullies. Scientists theorize the bright objects are pieces of dry ice that have broken away from points higher on the slope. 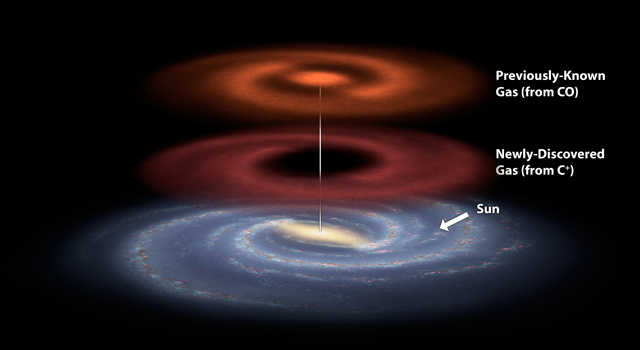 According to the new hypothesis, the pits could result from the blocks of dry ice completely sublimating away into carbon-dioxide gas after they have stopped traveling. "Linear gullies don't look like gullies on Earth or other gullies on Mars, and this process wouldn't happen on Earth," said Diniega. "You don't get blocks of dry ice on Earth unless you go buy them." That is exactly what report co-author Candice Hansen, of the Planetary Science Institute in Tucson, Ariz., did. Hansen has studied other effects of seasonal carbon-dioxide ice on Mars, such as spider-shaped features that result from explosive release of carbon-dioxide gas trapped beneath a sheet of dry ice as the underside of the sheet thaws in spring. She suspected a role for dry ice in forming linear gullies, so she bought some slabs of dry ice at a supermarket and slid them down sand dunes. That day and in several later experiments, gaseous carbon dioxide from the thawing ice maintained a lubricating layer under the slab and also pushed sand aside into small levees as the slabs glided down even low-angle slopes. The outdoor tests did not simulate Martian temperature and pressure, but calculations indicate the dry ice would act similarly in early Martian spring where the linear gullies form. Although water ice, too, can sublimate directly to gas under some Martian conditions, it would stay frozen at the temperatures at which these gullies form, the researchers calculate. 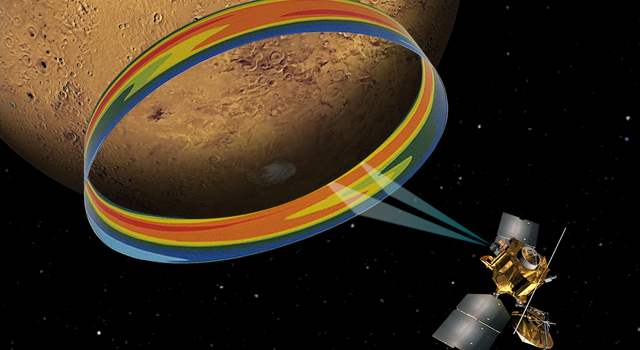 "MRO is showing that Mars is a very active planet," Hansen said. "Some of the processes we see on Mars are like processes on Earth, but this one is in the category of uniquely Martian." 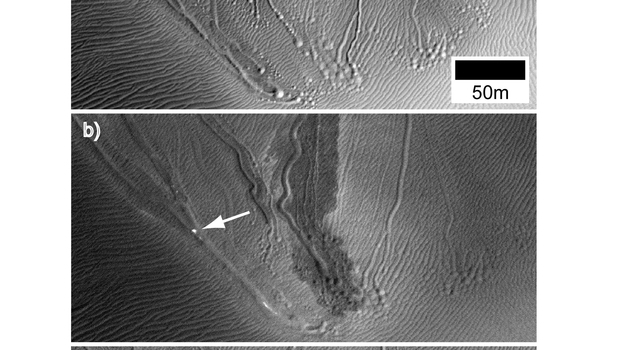 Hansen also noted the process could be unique to the linear gullies described on Martian sand dunes. 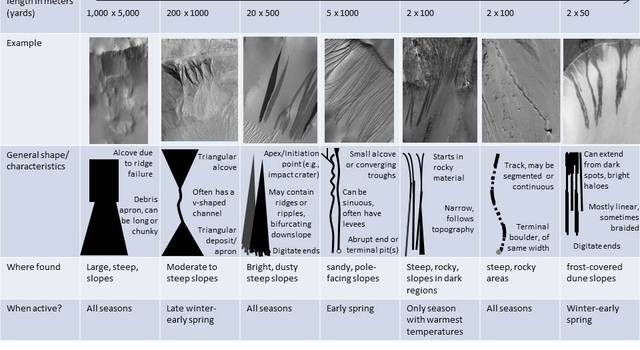 "There are a variety of different types of features on Mars that sometimes get lumped together as 'gullies,' but they are formed by different processes," she said. "Just because this dry-ice hypothesis looks like a good explanation for one type doesn't mean it applies to others." 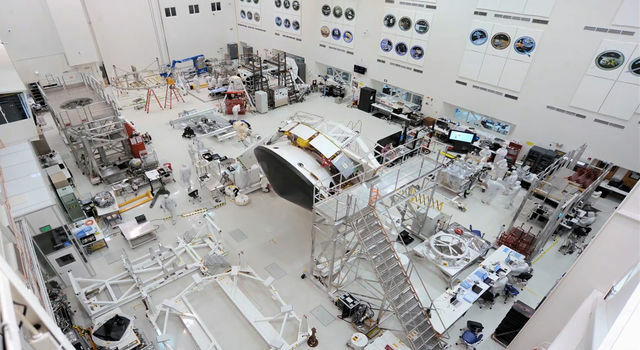 The University of Arizona Lunar and Planetary Laboratory operates the HiRISE camera, which was built by Ball Aerospace & Technologies Corp. of Boulder, Colo. JPL, a division of the California Institute of Technology in Pasadena, manages MRO for NASA's Science Mission Directorate in Washington. Lockheed Martin Space Systems, Denver, built the orbiter. To see images of the linear gullies and obtain more information about MRO, visit: http://www.nasa.gov/mro . 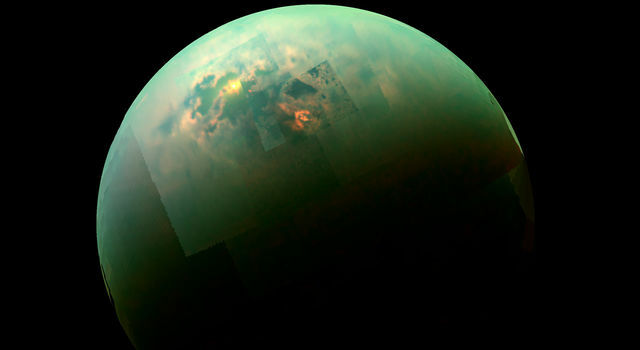 For more about HiRISE, visit: http://hirise.lpl.arizona.edu .